Southern Living’s Best Carrot Cake is a crown jewel of a dessert, with moist layers, a rich buttermilk glaze, and delectable cream cheese frosting. 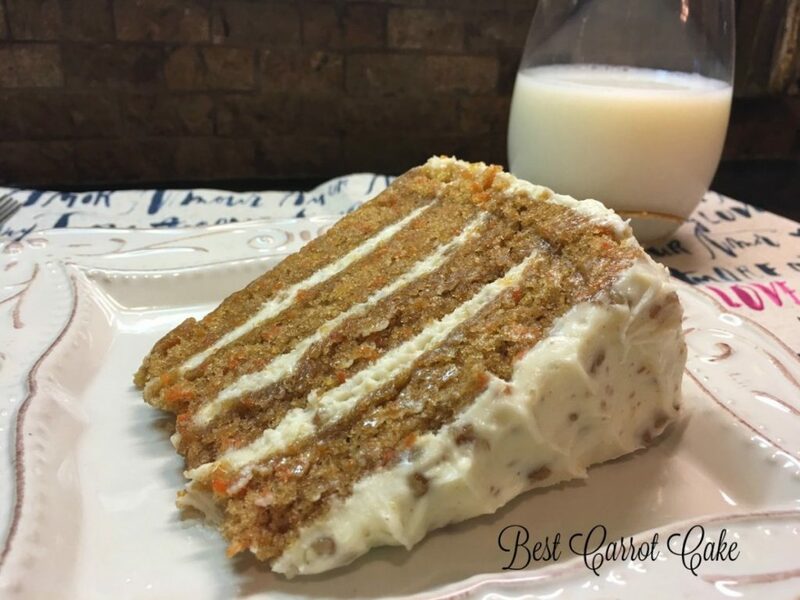 When Southern Living published this recipe and named it their Best Carrot Cake, I took note. I made this for a small group, and it was a hit. I had several requests for the rcipe, and many folks commented that it was the best carrot cake they’d ever eaten. The recipe below is slightly adapted from the original. Instead of 9″ cake pans, I use three, sometimes four, of these 8″ round non-stick pans. I always use these parchment paper liners for the pans, along with Baker’s Joy cooking spray, to ensure easy release of layers with no sticking. Make ahead: I like to make the layers up to one month ahead and freeze them, as they frost so much better when frozen. On the day of serving, I make the frosting, spread it on mostly frozen layers, and place the cake in the fridge until serving time. The cake needs to be refirgerated to maintain best consistency. Buttermilk glaze: This glaze really sets the cake apart and makes it special, so I never leave it out. Since it is so sweet, I usually only end up using half to 3/4 the amount. I pour just a little bit on each layer before spreading it evenly with a pastry brush. Nuts: You can use either pecans or walnuts, and you can put in the cake, the frosting, or both! Do whatever suits you, but make sure the nuts are chopped as small and uniformly as possible for the best appearance. This cake truly is delectable and worth the effort to make. Guests will truly oooooh and aaaahh when you serve it. If you make it, please leave your comments. As always, thanks so much for stopping by. Be blessed, and stay savvy!!! Line 3 (8-inch) round cakepans with parchment rounds. Spray cake pans with floured spray (Baker's Joy); set aside. Stir flour, baking soda, salt & cinnamon in small bowl. In mixer bowl, add eggs, sugar, oil, buttermilk & vanilla. Mix at medium speed with an electric mixer until smooth. Add flour mixture, beating at low speed until blended. Fold in carrot, pineapple, coconut & walnuts. Pour batter (divided evenly) into prepared cakepans. Bake for 25 to 30 minutes or until a toothpick inserted in center comes out clean. Allow layers to cool at least 10 minutes. Using toothpick, poke holes randomly in each layer (to absorb glaze). Bring first 5 glaze ingredients to a boil over medium-high heat. Boil, stirring often, 4 minutes. Drizzle glaze evenly over layers; spread over layers with pastry brush. Cool layers in pans for at least 15 minutes. Remove from pans, and cool completely on parchment paper. Freeze layers until they firm up completely (at least an hour, preferably all day). Remove when ready to frost. Beat butter & cream cheese at medium speed with mixer until smooth. Add powdered sugar and vanilla; beat until smooth. Add more sugar if needed to reach desired consistency. Stir in nuts. Spread frosting onto frozen layers~putting more on top & sides.